No, Mulhouse isn’t at the ends of the earth! Are you shocked? Well you’re in for more surprises! 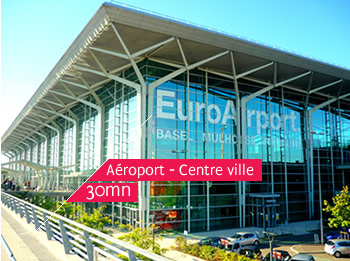 EuroAirport Basel – Mulhouse – Freiburg Airport is 30km from the town centre. Over 6 million passengers from almost 100 destinations in 30 countries a year land at the international airport. Twenty low-cost and regular airlines fly to EuroAirport. The easiest way to get to Mulhouse from the airport is by taxi. It costs approximately 45€ for the 30 minute car journey. The shuttle bus takes you to Saint-Louis station where you can take the train to Mulhouse in approximately twenty minutes. Mulhouse is based on the TGV and Rhin-Rhône lines and 40 TGV trains a day come here from Paris (2 hours 40 minutes), Roissy Charles de Gaulle Airport (3 hours 10 minutes), Lyon (2 hours 45 minutes), Marseille (4.5 hours), Montpellier (4 hours 50 minutes), Frankfurt (2 hours 10 minutes), Zurich (1 hour 20 minutes), Stuttgart (2 hours 10 minutes) etc. 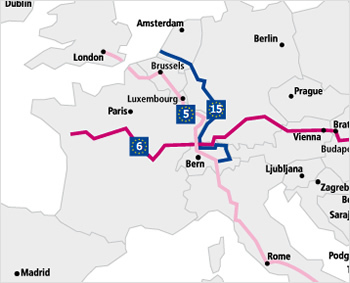 An extensive train network takes you to towns in Strasbourg, Colmar, Basel and Alsace whilst international and night trains arrive from Italy and Eastern Europe. It’s easy to reach your destination by tram, tram-train, bus, taxi, bike or on foot from the central Gare Centrale station. Alsace may not be in the centre of France but it is incredibly easy to reach via the French A35 and A36 motorways, linked to the major A6 and A4 roads in France, the A5 in Germany and the A… in Switzerland. And motorways are toll-free in Alsace! "Cité de l'Automobile - Collection Schlumpf" is the largest auto museum in the world! Bike lovers adore it here with three Eurovélo routes running through Mulhouse: Eurovélo 6 Atlantic-Black Sea along the Rhône Canal in Rhin, Eurovélo 15 along the Rhin and Eurovélo 5 Via Romea Francigena between London and Southern Italy. Given Mulhouse’s status as a bike-friendly town, you’ll find all the services and providers you need for your mode of transport. Awarded the Ville Vélotouristique label for bicycle-friendly cities in 2012, Mulhouse and its region offer many amenities, services and facilities designed for bicycle tourists: over 300 km of cycle paths, a pumping station, repairers and spare parts retailers etc. Ice skates, scooter, helicopter or horseback. 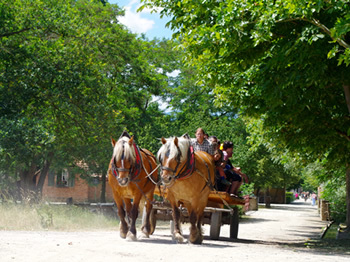 However you’re getting around, we’ll provide you with a warm welcome and suitable facilities. If you have a particular requirement, please contact us. You’ve got it: Mulhouse’s geographical location makes it ideal for communication and its many adapted infrastructures make it an easy-to-reach destination.